I have seen the Pope, not at a great distance, as the other day at St Peter’s, nor for a few moments, but close enough to touch and for more than a good half hour; that says little, for when I recapitulate all that was said on both sides, I am tempted to believe that it took nearly an hour to cover everything. You would have been touched, my dear friend, to see, while I spoke, how this holy Pontiff raised his eyes towards heaven, then joined his hands and bowed his head on them clasped together, glowing with gratitude and thanking God with all his heart. 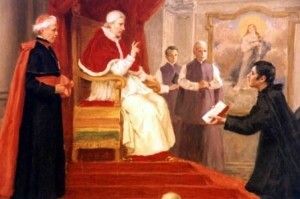 My dear friend, my dear brothers, on February 17, 1826, yesterday evening, the Sovereign Pontiff Leo XII confirmed the decision of the congregation of Cardinals and specifically approved the Institute, the Rules and Constitutions of the Missionary Oblates of the Most Holy and Immaculate Virgin Mary, and accompanied this solemn act of his pontifical power, with most admiring words for those who happily form this Society from which the head of the Church indeed expects the greatest good. From now on how can we not be overwhelmed with gratitude towards God and, looking seriously at ourselves, not attach ourselves still more to the Society which has just obtained such convincing proofs of the protection of the Lord, to whom we now belong in quite another manner since, in the hierarchical order, it is by her that we are attached to the supreme Head of the Church who is our supreme guide. This morning I reflect on how I sit with the Church and with the Pope and focus in on something that Eugene wrote – something that I most certainly have read before but today it hit me quite differently. He wrote of the Pope listening to him; “Glowing with gratitude and thanking God with all his heart.” As the Pope listened to him this is what Eugene witnessed. In the presence of something or someone who is holy, who is filled with a great peace, who shares a love that is pure and beautiful. Perhaps this is why I reached out as I described yesterday to touch the car of the Pope as it passed by me. I think of the times that I have cried with silent tears coming from my eyes. It has happened when I have been listening to another(s) as they spoke of God, sharing a very deep part of themselves. It happens being in the presence of something that is utterly good – beautiful – holy. It is a recognition. The other morning I sat during my time of prayer and meditation, trying to push aside my busyness and problems and thoughts. At some point I must have managed to do that for I seemed to come out of or away from nothing, an emptiness of some sort and my heart was weeping – not out of sadness but I think because it was for a moment engulfed in immense and perfect love and beauty. I thanked God, that was the only thing that I could consciously do and then got up to start my day. When I think of this I am most grateful, to Eugene, to the Pope who approved the Constitutions and Rules – and it flows down with gratitude for many others. Over all – look at what God has given to me, to us.